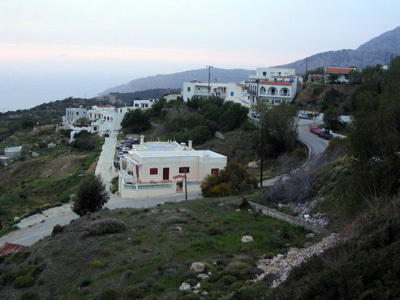 Piles is a small village located on the western side of the island, about 14 km from Pigadia. There are several small restaurants and coffeehouses here. But Piles is perhaps better known for its exquisite sunsets. From here, you can see the island of Kassos. On a very clear day, you can even see the island of Crete. The best view of a Piliatiko sunset is from the "Panorama" Cafe/Restaurant. Enjoy delicious grilled "kontosouvli" (the best on the island) with owners Manoli and Elia.